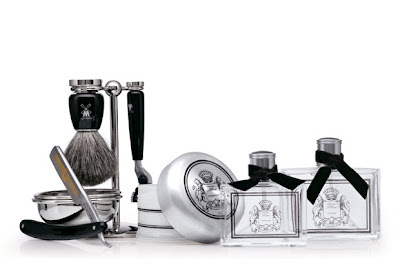 This is a beautiful, gorgeous shaving set. It's sterling silver, and the whole thing costs about $700. A present fit for a king. Saturday my sister and I had to do last minute Christmas shopping (by last minute I mean 20+ days before Christmas). We had very few things on our list, literally like 3, but that was enough to send us over the edge. After wading through throngs of mindless goyim moving in zombie-like fashion to spend an entire month's salary buying presents their family and friends may or may not like, totally unaware of what the holiday is about and creating an atmosphere that was so far and removed from "Peace on earth good will towards men", a concept which I doubt they've ever heard, I asked myself "What would Baby Jesus do?" and then I got it: "Sit down for a delicious cappuccino and financier at Garcia & Rodrigues". So that's what we did. After spending way more than we should have on water and coffee, we headed back to the hell hole that is the mall. We still had two things to do and we needed to be smart about them. Buying the perfect present for someone includes getting something that you can afford, so it's tricky business when all you see and all you love is the top of the line, most expensive things. We needed an extended break to renew our spirits. Cappuccino is not enough, not when you're looking at a sea of oxigen deprived drones moving in quase-dead fashion creating traffic jams and confusion. This is a silicone based hand and body lotion that absorbs immediately into the skin leaving behind the softest, most angelic epidermis you could possibly imagine. I will dream of this until I go back and buy it. It's heavenly, but the price is not. Then we saw it. The heaven's opened, the light shone down and a choir of angels announced the first sighting and splendor of Tania Bulhoes. For all of you who don't know what this is, and are guessing that it's a store, you are mistaken. It is so much more than just a store. It is an oasis for the weary, a place of peace and joy. It is a haven, a sanctuary - if you will. A place where the weary mall traveler can enter and be immediately envoloped in the tranquility of a water wall, the beauty of the comforting apothecary-like walls of luxurious, decadent, extravagant, and magnificent array of bath and body products. Sterling silver trays and candle holders, Swarovski crystal embedded perfume bottles, and other accessories, decorate the tables at the center of the store. Old world velvet chairs and chaises line the walls, while tasteful flower arrangements in muted colors welcome the grateful client. Every possible pamper is offered and sold. I know there is a huge store/spa in São Paulo, but I've never been. While the store here in Rio is much smaller, it is still grandious and imposing, although I'm sure not as much as the "mother ship". Click here to go to the Tania Bulhoes website to get an idea of what I'm talking about. I believe all images are of the SP store.